I am not sure how It Was Me All Along came into my queue. I think it was a library recommendation based on the high number of memoirs I consume. I downloaded it without reading the description. Upon listening, my breath caught in my throat. Her descriptions of food, in terms sensual but never tawdry, were delicious. And the author’s ability to capture that sensation I knew so well, of eating eating eating to the point of too-stuffed, uncomfortably full, felt familiar. Oh, how I know that feeling, the pleasure wrapped in the pain of being overfull. Oh, how I know the twisty and complicated elements that play into emotional eating, of filling up the holes inside with consumables. Andie Mitchell chronicles her journey with food: loving it, inhaling it, growing large larger largest, losing half her body weight (135 pounds), developing disordered eating and addictive behaviors around food and exercise as a rebound from two decades of extreme food addiction. She points out that when she was fat, others would avoid talking about her body, but upon beginning a weight loss journey, suddenly her body was grounds for public discussion. She described the ways that others’ bright comments about her appearance reinforced her feeling that as a heavy/overweight/fat person, she was less valuable than she was at half her previous size. She explored the ways that heft and weight and body and the social unacceptability of some bodies over others contribute to challenges in love and relationships. Hearing her read, I felt less alone. Having personally gained and lost a couple hundred pounds in my adult life, I have a love/hate relationship with tales of transformation and redemption with regard to painful patterns with food and body and size. For years I’ve avoided deeply delving into the subject of size and fatness and body acceptance and dieting and my own convoluted relationship with food and fitness and fatness. It’s tiresome. I’m tired. “Tell Me I’m Fat,”an episode of the This American Life radio show and podcast that aired during summer 2016, inspired me to seek out media and writing on the topic (see Jes Baker, Things No One Will Tell Fat Girls, and Roxanne Gay, Bad Feminist). 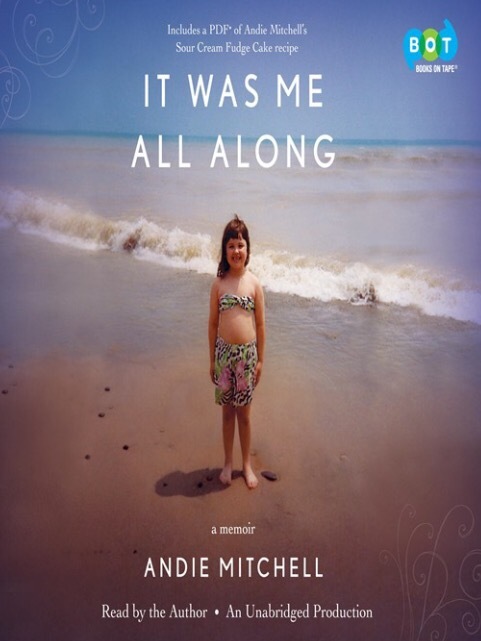 Andie Mitchell’s book added significant heft to the wedge of words and stories that may at long last pry open the door on this topic for me personally. She tells her story unflinchingly, with grace, compassion, and accountability. However it landed in my ears, I’m taking it as serendipity that it arrived.